When this photograph was taken, the Hotel Chauvet was in the early stages of conversion into condominiums. The Hotel Chauvet reflected in the window of the Jack London Saloon. 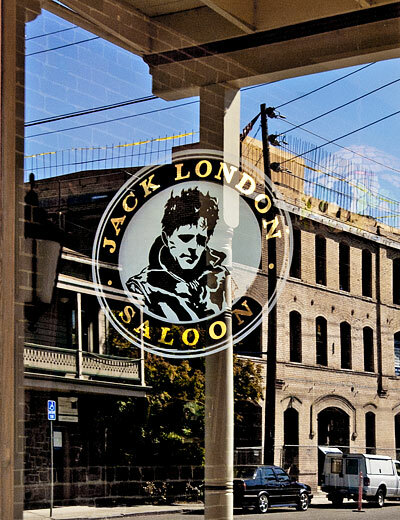 The Jack London Saloon is about a mile and a half from Jack London's Ranch. In 1882, the development of the railroad lines in Sonoma Valley brought the first onset of tourist activity to Glen Ellen. In an area that primarily had been agricultural, with a few residences, a cooper shop, a stage coach line and a hotel, the next twenty years would bring tremendous changes to the area. By the turn of the century, many resorts and hotels and saloons would be established. The wine,industry in 1880 was large and productive and was developing a widespread reputation. Joshua Chauvet was the owner of a large wine operation south, of town and produced 125,000 gallons of wine in that year. Sonoma County at that time surpassed all other areas of California in wine production. It wasn't until 1885 that Napa Valley surpassed Sonoma in total wine production. By 1900 the Southern Pacific and Northwestern Pacific railroad lines would bring as many as 3,000 visitors on weekends. San Francisco Bay Area residents, eager to escape the local fog, could board the train at the ferry terminal in Marin. Families could stay in hotels, cottages, tent cabins or tents in Glen Ellen. The availability of good transportation allowed working businessmen to join their families on weekends. Glen Ellen had established itself as a busy destination resort. Camping out and warm summer weather were only part of the attraction for tourists. The five hotels in the early 1900's, the Glen Ellen, Riverside, Mervyn, Roma and Hotel Chauvet, provided dancing and entertainment. In 1914, the Hotel Mervyn advertised bathing, boating and fishing. The eight active saloons, Sobbe's, Pancrazzi's, Thierkoff's, The Pioneer, Monahan's, Mervyn Hotel, Hotel Chauvet and another above the butcher shop, were lively spots. In fact, in 1901 the citizens were granted a separate township from Sonoma for the purpose of acquiring a constable and a justice of the peace to keep order in the village. In the spring of 1903, Jack London brought his family to Glen Ellen for the summer. In 1905, he bought the property that became the "Beauty Ranch." Through his writing, the Valley of the Moon became well-known throughout the world. In 1916, Glen Ellen acquired additional tourist entertainment, a large auditorium on Carquinez Street, where movies were shown twice a week. The Hotel Chauvet in 1918 was boasting its place as "Glen Ellen's big hotel," with new decor and furnishings. Prohibition caused the resort town to go dry. With the beginning of automobile travel in the late teens and early twenties, the railroads declined in popularity, and the tourist establishments in Glen Ellen also lost business. The last train to Glen Ellen finally was disbanded in 1941. The Hotel Chauvet is the only remaining structure of all the hotels and saloons of the early 1900s. 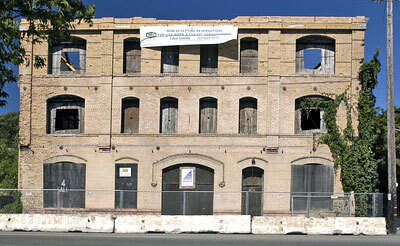 It is the largest building and a major focal point in the small central historic district that comprises four historic buildings, three of which were built by Joshua Chauvet. It is situated between the Joshua Chauvet House, a fine small brick home (1905, already a designated Sonoma County Landmark #65), and Shone's Country Market (1905, the former post office), a two-story commercial with the ground floor built of native stone by Mr. Poppe. The other remaining historic building in central Glen Ellen is northeast of the Hotel Chauvet and across the street from it. Now known as the London Lodge (1905), it is a two-story brick commercial used in early times as grocery store. The Hotel Chauvet is a formidable reminder of the history of Glen Ellen within the small, central district.